The Kazak ethnic group, with a population of 1.25 million, mainly lives in the Ili Kazak Autonomous Prefecture, Mori Kazak Autonomous County and Barkol Kazak Autonomous County in the Xinjiang Uygur Autonomous Region. Some are also located in the Haixi Mongolian, Tibetan and Kazak Autonomous Prefecture in Qinghai Province and the Aksay Kazak Autonomous County in Gansu Province. The Kazak language belongs to the Turkic branch of the Altaic language family. As the Kazaks live in mixed communities with the Hans, Uygurs and Mongolians, the Kazaks have assimilated many words from these languages. They had a written language based on the Arabic alphabet, which is still in use, but a new Latinized written form was evolved after the founding of the People’s Republic of China. Except for a few settled farmers, most of the Kazaks live by animal husbandry. They migrate to look for pasturage as the seasons change. In spring, summer and autumn, they live in collapsible round yurts and in winter build flat-roofed earthen huts in the pastures. In the yurt, living and storage spaces are separated. The yurt door usually opens to the east, the two flanks are for sleeping berths and the center is for storing goods and saddles; in front are placed cushions for visitors. Riding and hunting gear, cooking utensils, provisions and baby animals are kept on both sides of the door. The pastoral Kazaks live off their animals. They produce a great variety of dairy products. For instance, Nai Ge Da (milk dough) Nai Pi Zi (milk skin) and cheese. Butter is made from cow's and sheep's milk. They usually eat mutton stewed in water without salt – a kind of meat eaten with the hands. By custom, they slaughter animals in late autumn and cure the meat by smoking it for the winter. In spring and summer, when the animals are putting on weight and producing lots of milk, the Kazak herdsmen put fresh horse milk in shaba (barrels made of horse hide) and mix it regularly until it ferments into the cloudy, sour horse milk wine, a favorite summer beverage for the local people. The richer herdsmen drink tea boiled with cow's or camel's milk, salt and butter. Rice and wheat flour confections also come in a great variety: Nang (baked cake), rice cooked with minced mutton and eaten with the hands, dough fried in sheep's fat, and flour sheets cooked with mutton. Their diet contains few vegetables. The horse-riding Kazak herdsmen are traditionally clad in loose, long-sleeved furs and garments made of animal skins. The garments vary among different localities and tribes. In winter, the men usually wear sheepskin shawls, and some wear overcoats padded with camel hair, with a belt decorated with metal patterns at the waist and a sword hanging at the right side. The trousers are mostly made of sheepskin. Women wear red dresses and in winter they don cotton-padded coats, buttoned down the front. Girls like to sport embroidered cloth leggings bedecked with silver coins and other silver ornaments, which jangle as they walk. Herdsmen in the Altay area wear square caps of baby-lamb skin or fox skin covered with bright-colored brocade, while those in Ili sport round animal-skin caps. Girls used to decorate their flower-patterned hats with owl feathers, which waved in the breeze. All the women wear white-cloth shawls, embroidered with red-and-yellow designs. The Kazak family and marriage in history fully showed the characteristics of the patriarchal feudal system. The male patriarch enjoyed absolute authority at home; the wife was subordinate to the husband, and the children to the father. The women had no right to property. The marriage of the children and the distribution of property were all decided by the patriarch. When the man came of age and got married he received some property from his parents and began to live independently in his own yurt. Only the youngest brother eventually stayed with the family. Herdsmen with close blood relations formed an "Awul" (a nomadic clan). Rich herd owners or venerated elders were considered the "Awulbas" (chiefs of the community). The Kazak people usually practiced monogamy, but in the old society, polygamy was quite common among the feudal lords and tribal chiefs, in accordance with their Islamic faith. The feudal mercenary marriage system deprived young men and women of their independence in matrimonial affairs and high bride prices were charged. Hence richer people married up to four wives each and poor herdsmen were unable economically to establish a family. Among the latter, a system of "barter marriage" was practiced. Two families, for example, could exchange their daughters as each other's daughter-in-law without asking for betrothal gifts. This often gave rise to a large disparity in age of the matrimonial partners, let alone mutual affection. The Kazaks are warm-hearted, sincere and hospitable. They entertain all guests, invited and uninvited alike, with the best things they have – usually a prize sheep. At dinner, the host presents a dish of mutton with the sheep's head to the guest, who cuts a slice off the right cheek and puts it back on the plate as a gesture of appreciation. He then cuts off an ear and offers it to the youngest among those sitting round the dinner table. He then gives the sheep's head back to the host. The Kazaks are Muslims. Though there are not many mosques in the pastures, Islam exercises a great influence upon their social life in all aspects. Their religious burdens used to be heavy. They had to deliver religious food grain and animal taxes in accordance with Islamic rules. If they wanted to invite mullahs for prayers on occasions of festivals, wedding, burial ceremonies or illnesses, they had to present given amounts of money or property. The Kazaks' festivals and ceremonies are related to religion. The Corban and Id El-fitr festivals are occasions for feasts of mutton and mutual greetings. The Nawuruz Festival in the first month of the lunar calendar is a grand occasion to say good-bye to the old, usher in the new, and hope for a better year in stockbreeding. Every family entertains with "kuji," a food made of mutton, milk dough, barley, wheat and other delicacies. They give feasts when there are births, engagements or weddings. The Kazaks, men and women alike, are good horse riders. Young men like wrestling and a game in which horsemen compete for a sheep. There are horsemanship displays on the grasslands during festivals. The young people like to play a "girl-running-after-boy" game. The boys and girls ride their horses to an appointed place; the boys can “flirt with” the girls on the way. However, on the way back, the girls chase the boys and are entitled to whip them if they can as a way of "vengeance." Such merry-making more often than not terminates with love and marriage. This ethnic minority has its own rich literary heritage. As there were many illiterates, folk literature handed down orally was quite developed. After liberation, ballad singers, or "Akens," made great efforts to collect, study and re-create old verses, tales, proverbs, parables and maxims. Many outstanding Kazak classic and contemporary works have been published in the Kazak language. Kazak music and dance also have their own unique features and are very popular. The Kazaks like summer the best, terming it merry-making time. They often sing and dance throughout summer nights on the pastures. The two-stringed instrument is their favorite. 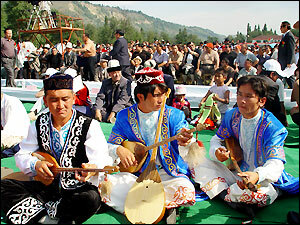 There are many records on the origin of the Kazak ethnic minority in Chinese history. In the more than 500 years since Zhang Qian of the Western Han Dynasty (206 BC-AD 25) went as a special envoy to Wusun in 119 BC, the inhabitants of the Ili River valley and round the Issyk Kul were mainly Wusun people and part of the Saizhong and Yueshi ethnic people, the forefathers of the Kazaks. As early as the reign of Emperor Wu Di (140-88 BC) of the Western Han Dynasty, Wusun established tributary relations of alliance with the Han court through the marriage of Xijun and Xieyou princesses and woman official Feng Liao with the Wusun King of Kunmo and senior generals. In the mid-sixth century, the Turkomans founded a Turkic khanate in the Altay Mountains. As a result, they mixed with the Wusun people, and the forefathers of the Kazaks later mixed with the nomadic or semi-nomadic Uighurs, Geluolus, Qidans (Khitans), Kelies, Naimans and Mongols of the Kipchak and Jagatai khanates. The fact that some of the Kazak tribes still retained the names of Wusun, Kelie and Naiman into later centuries sufficiently proves that the Kazak ethnic minority is an old ethnic group in China. In the early 13th century, as Genghis Khan marched westward, the Wusun, Kelie and Naiman tribes had to move likewise. Part of the Kipchak, Jagatai and Wuokuotai khanates of the Mongol Empire were Kazak pastures. In the 1460s, some of the herdsmen in the lower reaches of the Syr-Darya, under the leadership of Jilai and Zanibek, returned to the Chuhe River valley south of Lake Balkhash. As they went eastward to escape the rule of the Ozbek Khanate, they were named "Kazak," meaning "refugees" or "runaways." They then mixed with southward-moving Ozbeks and the settled Mongols of the Jagatai Khanate. As the population grew, they extended their pastures to northwest of Lake Balkhash, the Chu River valley and to Tashkent, Andizan and Samarkand in Central Asia, gradually evolving into the Kazak ethnic group. From the mid-18th century, Tsarist Russia began to invade Central Asia and eat up Kazak grasslands and areas east and south of Lake Balkhash – part of China's territory. After the mid-19th century, owing to aggression by the Tsar, the Middle and Little hordes and the western branch of the Great Horde were cut off from China. Russian Cossacks infiltrated the area, driving the Kazaks into the deserts where men and animals could hardly survive. From 1864 to 1883, the Tsarist government compelled the Qing court to sign a number of unequal treaties, forcing the principle of "people go with the land" on the "Tacheng Protocol on the Delimitation of Sino-Russian Boundary." This met with strong opposition from the local minority nationalities. Many Mongolians, Kazaks and Kirgiz migrated back to Chinese-controlled territory. Twelve Kazak Kelie clans grazing near Zhaysang Lake moved their animals south of the Altay Mountains in 1864. More than 3,000 families of the Kazak Heizai clan moved to Ili and Bortala in 1883. Many others followed suit after the delimitation of the border. The Ili Uprising during the Revolution of 1911 overthrew Qing rule in Xinjiang. However, it did not shake the foundation of feudal system, as warlords Yang Zengxin, Jin Shuren and Sheng Shicai gained control of the region. The Chinese Communist Party began to carry out revolutionary activities among the Kazaks in 1933. Fearful that their feudal privileges might be encroached upon, the feudal rulers within the ethnic group boycotted the establishment of schools and the development of farming, and other economic and cultural undertakings. Under warlord Sheng Shicai's rule, some Kazaks had to flee their homes, and others, because of threats and cheating by chieftains, moved to Gansu and Qinghai provinces from 1936 to 1939. There, they were plundered and massacred by warlord Ma Bufang. Ma also sowed dissension among the Kazaks, Mongolians and Tibetans, and instigated them to fight each other. As a result, the Kazaks launched an uprising in Golmud in 1939. Those in Gansu and Qinghai had to lead a vagrant life until China’s national liberation in 1949. A revolution against Kuomintang rule took place in Ili, Tacheng and Altay in 1944. Kazaks, who constituted the majority, and the Uygurs of Nilka County formed three armed guerrilla units to start it. During the period of the Liberation War in the later 1940s, the Kuomintang tore to shreds the "Eleven Articles on Peace" it had signed with the revolutionary government of the three districts. It instigated Usman, a Kazak political turncoat, to start an armed uprising to smash the revolution. He attacked Altay twice, in October of 1946 and in September of 1947, looting and burning the houses of the local people. The Kazaks and people of other ethnic groups beat him off in the end.